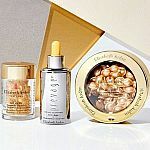 Nordstrom has Black Friday Beauty Gift with Purchase offer. Shipping is free. $54 on "Multi-Protection Anti-Oxidant 24H-Moisture Crème Broad Spectrum SPF 15" does not qualified for free 4-pc gift. And no reason is given.